Man who advised SS to expand Auschwitz-Birkenau camp. Other nazis. Man who advised SS to expand Auschwitz-Birkenau camp. Franz Romeikat (born October 7, 1904, date of death unknown) was an SS-Unterscharführer and staff member at Auschwitz concentration camp. He was prosecuted in the Auschwitz Trial.released during the 1950’s. Gerret Korsemann (* 8. Juni 1895 in Nebel (Amrum); † 16. Juli 1958 in München) war ein deutscher SS-Gruppenführer und Generalleutnant der Polizei. After the outbreak of World War II, he was commander of the Ordnungspolizei in Lublin in the German occupied Poland in 1940. In August 1941, he became SS-Brigadeführer and Generalmajor der Polizei and in the Soviet Union as higher SS and police leader (HSSPF) for special use (from 1 September 1941, intended for the Caucasus). in 1941 he was instrumental in the Organization of the mass shootings of 17,000 Jews of Rovno, where he was SS and police leader (SSPF) of 1 August 1941 until January 1, 1942. Early in 1942 he was responsible for the murder of around 12,000 Jews from Kharkov.It is also  suggested that he was involved in the killing of over **33,000 Kiev Jews in Babi Yar (29 and 30 September 1941). In July 1942 he was SS-Gruppenführer und Generalleutnant der Polizei. From mid-1942, he was title of the Caucasus (title “Rostov Avdiyivka”). After the withdrawal from the Caucasus, he served from March 24 to 5 July 1943 Deputy HSSPF for Russia middle in Mahilyow. At the same time, accusations against him came up in the summer of 1943 within the SS, cowardly he would behave during the retreat from the Caucasus. Corsican men wrote to his superior, field marshal Ewald von Kleist, to ask for a letter of discharge. Turned a senior SS officer to discharge to a Wehrmacht commander, Heinrich Himmler was “criminal shifted” so much that he demoted Korsemen and the Waffen-SS. From January 1944 until the war’s end he was a Hauptsturmführer in the Waffen-SS in the front. He led a company of the 3rd SS Panzer Division “Totenkopf”.After the war he was on Poland delivered, accused before a Polish court and sentenced to 18 months in prison in 1947. in 1949, he was released from prison and lived undisturbed in the Federal Republic of Germany. Fritz Arlt (Born April 12 Niedercunnersdorf, 1912 ; died April 21 2004 in Germany) was involved in Poland as a German Nazi functionary in leading role in ethnic cleansing , head of volunteer station East, head of the refugee control centre and employer association official in youth training centres. de.wikipedia, Arlt, google translation.Arlt in1932 joined the NSDAP (Mitgliedsnr. 1.376.685) , and – together with Helmut Schelsky – the SA . The transfer of power to the Nazi party, as a student, ran a relegation proceedings brought by the police against whom, due to a SA Brawl, experienced Arlt (Nazi party representation: he “was on the overthrow of the auxiliary police ready for Captain rust on.”). The relegation procedure was discontinued in April 1933. Arlt studied with Arnold Gehlen in Leipzig, he received his doctorate in 1936 this and Otto RECHE. Arlt studied here in a generation of students, which should form the future elite in the Reich Security main office.Arlt was unpaid employees of the Berlin Office founded in this year (RPA) in December 1934. 1933 Chairman of the Studentenwerk. 1934 Head of Kreisamtes for racial and population policy of the District of Leipzig. Beginning of the surveys on the population structure of the Jews in Leipzig, his doctoral thesis from 1935-36. To his circle of friends included Hans-Joachim Schoeps, Joachim WACH and Fritz Borinski – so a later self statement-. In August 1936, Arlt moved after graduating from Leipzig to Wrocław; in the local RPA, he became head of Office and district training manager in the University of Breslau was Arlt of lecturer for “Ethnography“. He was appointed there on a proposal by Martin Staemmler as its representative in the District Office for racial and population. In addition to family policy and racist propaganda, he carried out special orders for the oberpräsident Wagner in border policy. Arlt published an anti-Semitic magazine, which was later acquired by the high school of the Nazi party by the Technical Director, Kurt Wagner later, his racist theories among other things in the world. the Polish-speaking Arlt in the SS was discontinued in 1937, where he worked in the command staff of the higher SS and police leader (HSSPF) Upper Silesia. At the same time began his collaboration with the Department Canaris. Information for a possible war against Poland is gathered at the SD from 1937. A special investigation book Poland, which roughly included 61,000 names of Polish intelligence , was laid. Franz Six built up in the District II the Zentralstelle II P (Poland). Before the establishment of the Central Office II P (Poland) of the SD had made Herbert Hagen thoughts about “Connectivity to Poland” and noted, “that it comes to it, to know people that can give accurate information about the complete collection of Judaism in Poland in Poland”. Early 1938 the Gauleiter complained Silesia Josef Wagner at the Reich Ministry for science, education and national education, that the racial composition of Silesia in popular and half-scientific depictions often wrong is: Silesia “Nordic”, not “ostisch”, this is scientifically proven by studies Egon Freiherr von Eickstedts and his staff. He demanded to stop such representations in the future. Fritz Arlt was responsible for further information. head of the Anthropological Institute of the University of Vienna. Race-and blood research. and Fritz Lenz and Hermann Aubin to the Wroclaw’s representative of NODFG, to assess the Silesian investigation. Arlt had in 1938 together with Heinrich Tewes a book series “People, race, heritage value” in Silesia started later but along with Tewes to the publication of the Eickstedtschen Silesia investigation: “Race, people, heritage in Silesia” involved and probably also practical and organizational support provided. The assessment turned out negative due to personal animosity towards Eickstedt and legitimate methodological criticisms that contributed mainly Lenz, but also Otmar Freiherr von Verschuer . The Reich Ministry disguised its source and added in a statement of the “representative for the entire intellectual and ideological training of the Nazi party”. Arlt was forced 1943 by Fritz Bracht d. 1945 on orders from Berlin by Wagner’s successor to withdraw from the project. A censorship or a withdrawal of the book series was deemed as necessary also because Martin Staemmler , SA man, later father of German Sociology — which had made strong for them. Thus, the censorship attempt to the Ethnography of Silesia, the group around Arlt attempted failed by official and parteiamtliche decrees. This South-Western investigation, which integrated including the name index of church books by the NSLB, is the counterpart to Arlts Ethnography to “Blooded”. in 1938 Arlt became District Officer of RPAs in the Gau of Silesia. In the same year were Arlts “Volksbiologische studies” published. In these, he proposed to expel the Leipzig Jews as foreigners and according to their places of origin in Poland to deport. The approach proposed by Arlt was executed in 1938 en masse in an interaction by German and Polish Government by deportations . The response time of the Polish Government in the context of this first mass deportations of 1938 made it clear that the Government of Poland had selectable – rolling census data from 1931 – religion and mother tongue. In the evening of 29 October 1938, the Polish Government had arranged to deport German citizens of Poznań and Pomerelia . The German Government argued that the expulsion of Arians would exacerbate the clash, which the Polish Government pushed off only Jewish Germans. In August 1939, Arlt in Breslau drew up the so-called Jewish history, for which he has committed the Jewish, deported later to Auschwitz and murdered historian Willy Cohn by subpoena and made its knowledge advantage. He requisitioned relevant books “against Word of honour” from his extensive library. Arlt took part in the attack on Poland when a battalion of BRZEG. In the attack on Poland confiscated the SD of the data of the census in the University of Warsaw. In October 1939, Arlt head of “Population management and care” under the occupation regime of the Governor General of Poland, Hans Frank was. 30: 49 Fritz Arlt: night after night came Evakuiertenzüge, the the so-called resettlement Office, whose Chief Mr Eichmann was in the General Government people were kicked out from the trains, whether in the market place, at the station, where there was any where, and it cared nobody. 31: 13 So so we got a phone call from the district captain, which is about the Governor. He said, now, I no longer know what I should do. There are again so and so many therefore come I have neither home, nor to food, or otherwise something. 32: 25 When I think of Frank, so I have to say: was a tragic-comic figure. The Frank was a highly intelligent young man, was a good musician, pianist. Mr. Frank was one that placed a very high value on presentation and representation. Why man mocking way called the King of Poland. 35: 19 In our interview with him stressed Dr Arlt, that he wanted to help the occupied population. 35: 29 But this letter about the ethnic German farmers shows a different character from Arlt. 35: 43 He has the character of dictation A for Arlt, we reminded him of the existence of this letter. 35: 49 Yes what should I also still questions you! 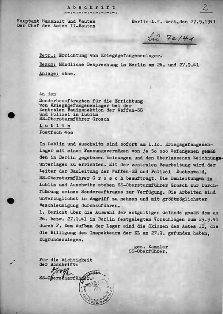 The letter led to a ring leader (military economic leader) were sent the ethnically German in a German concentration camp 35: 55. 36: 03 Question: but what was for you now a concentration camp?, if they say the mailing should be in a concentration camp? 36: 09 Arlt: What was a concentration camp for me? A warehouse for humans, who somehow dangerous are to the social order and have been concentrated there. 36: 35 Question: you Empfanden at the time that this perhaps is a harsh penalty? 36: 39 Arlt: You excuse that knew the people that which had so probably expect. Arlt: I know not, I’ve never been warehouse manager. 36: 58 Speakers: Dr Arlt entered the 1932 the Nazi party, ashamed he today in the Nazi party to have been? 36: 59 Arlt: Am I not ashamed, that I became a Nazi, but I definitely went with an absolute reflection of the situation analysis out to. The medical and nursing homes, elderly and ill patients were murdered in which, for example, the sick of the psychiatric institution Chelm on 12 January 1940 were under the Division “Population resources and care”. In July 1940, Arlt in the “Volkspolitischen information service issued by him” the Government of the General Government, internal management “Population management and care” attested (Cracow 1940) overview of the conditions of the population in the General Government and the occupied territory overpopulation: the area of the General Government was less than one-fifth of good arable land, rich population density but with 126 people per square kilometre almost to that of the German Empire used. “This is too much in terms of the natural resources of soil, as well as in terms of its industrial processing and creation.” (…) “The General Government is an übervölkertes area” (p. 20). “The Bevölkerungskundler know from history and the practical population policy three ways to solve the problem of overpopulation”, Arlt went on: the first possibility is that the “Decimation of the number of people through migration on time (Saisonwanderung)”. This was done through mass roundup of forced laborers for the German defence and agriculture. The second “solution” is called the “final emigration”Arlt. These, Arlt, Castle is however not possible by the war. On the third solution, the physical destruction, Arlt pointed in the form of reflections. They concerned the increase in the mortality of the most vulnerable victims of the Nazi regime, the infants and over 65 years of age, and the “Number of itself life poor, the infirm and the sick in the other layers of the age” (p. 9). Arlt described them as “the subject most the the extinction process layers” Arlt-Director of the Central Institute for research was later in Upper Silesia and is also head of the Branch Office of Upper Silesia in the Reich Commissar for the consolidation of German nationhood. Arlt was transferred by the Wehrmacht in 1940 in the SS. The head of SS head, Gottlob Berger commissioned his friend Fritz Arlt to form “Volunteer station East”. Foreign volunteers of the Waffen-SS from Eastern Europe non-Russian battle units in the armed forces were combined in “Volunteer station East”. * Reiner Olzscha,und Obersturmbannführer im Amt D 3 des SS-Hauptamtes, is still known from this team Julius and military leader in the D 3 of SS headbecause he has operated well journalistically. He was responsible for Muslim soldiers of the SS and fled so at the end of the war together with his ideological leader, Mufti, in the West. Olzscha Reiner (born July 26 1912 , died.?) – German physician, writer, explorer, member of the SS , head of the Arbeitsgemeinschaft Turkestan , while the commander of the Combat SS Wschodniotureckiego Association at the end of World War II After the war he was arrested in the area of Saxony by the NKVD . His further fate is unknown. 1941 Arlt built up, after he through Bracht when Stabsfüher of B.d.R.RFSS/RKF was acquired, the Hauptamt Volkstum issues, school and education, as well as the Upper Silesian Research Institute. 1943, Arlt was intrigue in the Nazi party and the German Ethnography victim according to its own. He volunteered to the troop, was trained to assault guns and took part in the battles of the SS-Panzer Division “Das Reich” . He was wounded in 1944 and took over control of the Volunteer Center East (for the Balts, Ukrainians, Weißruthenen, Cossacks) of the SS. When the war ended he was taken prisoner with a Ukrainian volunteer unit. Thankfully, Berger was the organizational creator of the Waffen-SS; Berger was appointed in addition to its already diverse functions on 1 October 1944 by Heinrich Himmler as head of the war prison system. In this role, Berger had allowed in April 1945 that American prisoners were supplied by food convoys under Ernst-Robert Grawitz of the German Red Cross . “Volunteer station East” became the “refugee control centre”. In November 1944, SS – Obersturmbannführer was nominated for promotion to Standartenführer by his superiors, SS-Obergruppenführer and General of the police of Ernst Heinrich Schmauser,dead 1945. End January 1945 but became the application for transport, since he was still too young, rejected. In January 1945 was the 14th Waffen grenadier Division of the SS (Galician) as 1. newly-formed Ukrainian Division of the Ukrainian national army , a formality which took place only on paper (but later saved the lives of the soldiers). There came the Division in British captivity in May 1945. In contrast to most other Eastern European voluntary associations, their loved ones for the most part not to the Soviet Union were delivered, but were allowed to emigrate to Canada and Australia. in 1945, the “German Red Cross” was largely dissolved by the occupying forces, in the French and the Soviet occupation zone, the DRC was prohibited. In the new application to the Central Committee of the national Red Cross societies of 26 June 1952, the fact was described as follows: “these in 1921 under the name of ‘ German Red Cross ‘ founded national company, which extended its activities to the whole of the German region, was dissolved in the course of the summer of 1945 by a decision of the occupation authority.”. Arlt was founded in 1949 in Munich as a so-called “followers” entnazifiziert; previously, he had drawn up studies on ostpolitische relations of the Germans and the psychological warfare for the Americans. After 1945 Arlt contributed with his friend Schelsky and Wagner to build the Search service of the German Red Cross . From 1954 to 1957, Arlt headed the Department “Education and socio-political questions” at the Institute of the German economy in Cologne. He was also member of the Executive Board of the Federal Association of German employer associations. The State German-French Youth Office (DFJW) elected him a Deputy member of the Board of Trustees; in January 1966, he resigned from the Panel after public pressure. With the last Minister for intra-German relations, Dorothee Wilms, Arlt published four books on the social and economic policy. From 1972 to 1978, Arlt was active as a freelance management consultant. In the Generalgouvernement Arlt was engaged in “evacuating“ the jews. In November 1940 he proposed the enlargement of the KZ Auschwitz. After the WW II Arlt was Leiter des Suchdienstes des Deutschen Roten Kreuzes. Richard Hartmann (born June 8, 1881 in Neunkirchen; – 5 February 1965) was a German orientalist. He published work on the Arabic and Islamic studies, of which many in her review (ZDMG) published the Deutsche Morgenländische Gesellschaft (DMG). past over. The degree of “voluntary” in the overflow is controversial. The taught spoolers (as a non-Muslim). The two orientalists acted within the framework of a “consortium of Turkestan” of the SS Division ‘Islam’ (there were other divisions, such as geography;) Agriculture and climate; (among others.) After the war, the leader involved Obersturmbannführer Reiner Olzscha has reported extensively. One of the protagonists in this training by field mullahs was the ***Grand Mufti of Jerusalem Amin al-Husayni, who wanted to realize his pan Islamic ideas. His friend Gottlob Berger was the institutional protection . The project proved in Olzschas perspective to the war flop; the “students” to the box Mullah had want to express himself especially the hard conditions in the prison or before a direct NAZI combat mission; they were mostly non and looked through the “theater”. After the bombing of Dresden, seat of the Mullah school and AG, a part of them disappeared, another marodierte until the remaining 20 men eventually were evacuated to Munich, where they formed the nucleus of an active group of “Muslim displaced persons” under the protection of the local State Government after 1945. Bertold Spuler (born December 5, 1911 in Karlsruhe; died March 6, 1990 in Hamburg) was a German orientalist.Spuler was appointed a full Professor of Semitic philology and Islamic studies at the University of Munich in 1943. Spuler joined later as head of the Islam Institute of the Georg-August University of Göttingen, where he taught Muslim Legion, mostly Soviet prisoners of war, during the Imam-time from June 1944 initially in 14 days, later then 3-4 months long or Mullah courses in religious knowledge and in the Ritualistik of Islam, in order to attract them to so-called box mullahs. In addition, spoolers of the head of the “History” in the Association of Turkestan, a RSHA creation within the DMG was. After the second world war, he took over the Chair of Islamic studies at the Department of history and culture of the Near East of the University of Hamburg in 1948 by Rudolf Strothmann and was founder of scientific discipline of Egyptology at the University of Hamburg , as well as editor of the Handbook of Oriental Studies (Handbook of Oriental Studies). In addition to an Imam school opened on the 21.04.1944 in Guben (Mufti papers: 212,213), there was a SS-Mullah school founded at the behest of the SS Reichsführer Heinrich Himmler from November 1944 in Dresden specifically for so-called “Russlandtürken”, so Muslims from the region of the USSR, who served in the SS (j. Hoffmann: 142). These were organized specifically in the “Eastern Turkish arms Association” and in the “Caucasian weapons of” within the SS. This device was a previously existing “Arbeitsgemeinschaft Turkestan e.V.”. This association was founded in January 1944 in the context of the “German Oriental Society (DMG)”. The Association had said more precisely one two addresses in Berlin and one in Dresden, the Taschenberg 3 in downtown Dresden. The seat of the association located in the city centre should be been affected strongly by the bombing of Dresden on 13 February 1945. Dresden was not the only Saxon place where the Grand Mufti longer staying in addition. He lived together with his staff of about 60 Arabs on the basis of the risk of bombing in Berlin from the summer of 1944 to April 1945 as a personal guest of Hitler’s (F. V. Seidel: 266) in the small Eastern Saxony health resort of Oybin. The Muslims, who had fought during the second world war on the German side as far as possible in the zones of the Western allies fled after the war. Here, they were the Group of so-called Muslim refugees and settled especially in South Germany and especially in Swiss or were settled there. This group organized in “Ecclesiastical administration founded in 1951 in Munich of Muslim refugees. This entry was posted on 02/02/2012 at 12:21 am and is filed under Hitler, Holocaust, Jews, National Socialism, Nazis. You can follow any responses to this entry through the RSS 2.0 feed. You can leave a response, or trackback from your own site.